The Entrance – Charlton Village Hall has a wheelchair friendly access entrance, including a metal wheelchair ramp. In the lobby there are plenty of coat hooks. The Main Hall – The main hall is a large and spacious area with wooden floor and large French doors which open out onto a patio area with wonderful views over the recreation ground and Charlton countryside. The hall can easily accommodate 100 people (seated) and up to 150 (max). Bar Area – There is a fitted bar area (3.1m wide by 2.1m long) with access from the kitchen and hall. In the bar there is a small freezer. If you would like to use this (e.g. to store ice cream) please inform the Hall Booking Secretary. The Kitchen – The kitchen is accessible from the entrance lobby and the main hall. Its fully equipped with everything you need – boiling water dispenser, kettle, sink, dishwasher, heated cabinet, fridge, microwave, oven and hob. Use of the everyday crockery and cutlery in the kitchen and the glasses under the bar is included in the hire charge. All breakages must be reported to the Hall Booking Secretary. China and Glasses – There is also have a range of sophisticated white crockery, cutlery and glassware available – perfect for a wedding reception or family party. 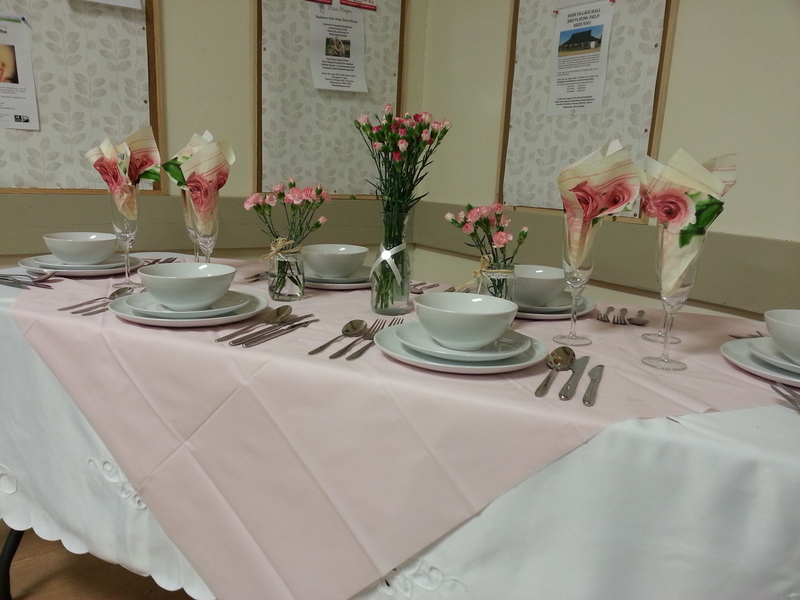 These items can be hired for £1.50 per full meal setting or 10p per item for less formal events. The Car Park – With ample spaces for around 20 cars, parking isn’t an issue! Play Area – Let the children have fun in our own play area in the Village Hall grounds. The table below contains the booking charges that apply for all business, event and party bookings. When booking an Other Event, the hirer must request a period that covers the total occupancy of the premises (i.e. including setting and clearing up). Prices for regular bookings are available on request. A refundable deposit will be required to secure all bookings of EITHER £100 for a Special Event, Friday or Saturday Evening OR £50 for all other bookings. The Special Event Package comprises an all day booking, plus access to the premises from midday on the previous day to 10.00 am the following day. The cost includes use of all Hall facilities, Parking and a roped off area outside (large enough to incorporate a marquee). If items are to be left on the premises overnight, the hirer should discuss security arrangements with the Hall Booking Secretary at time of booking. PLEASE only use paper confetti. The Children’s Party Rate provides access to the premises for 4 hours and is available for parties of children up to and including 12 years of age. Charlton Village Hall also boasts a sports field which can be hired for private use or club activities. You can book the sports field only or combine it with hire of the hall, if required. Please note – the Recreational Centre Management reserves the right to vary the stated charges for the hall and sports field bookings in special circumstances.